Some of you would remember weaving units north of Calicut in the Badagara area and Beypore, others may remember the textile trade mentioned in the 12th century Payyanur Pattu in North Malabar. These days you do find coarse crepe material from some remaining handloom units in Malabar but what is the real story of Calico? Did all the Calico exported to Europe get woven in Calicut? Or was it just an exporting center from historic times through its famous ports? Some of you may even believe that British renamed Kozhikode to Calicut due to the textile Calico. And let us take a deeper look at the name Calico, was the place named after the cloth? Actually it was the other way around - Kozhikode became ‘colicoda’ to the Portuguese tongue and thence Calicut to the British lips. The cloth got its name from the place, not the other way around. Greeks termed cotton ‘sindon’ from India – Sind. Indian cotton has been mentioned by Heordotus in 445BC, and later by Arraian in 2nd century AD as an article of commerce. It has also been established that the early weaving industry was concentrated in the Coromandel regions. So the route from those weaving units to Malabar would have been through the Malabar gap and any boats that circumvented the southern cape. I would assume that the various guilds were involved in these activities but more about all that later. Anyway the distances and terrain being long and difficult, it became necessary for relocation closer to the exporting ports and then again other reasons which we shall read about forced the weavers westwards. 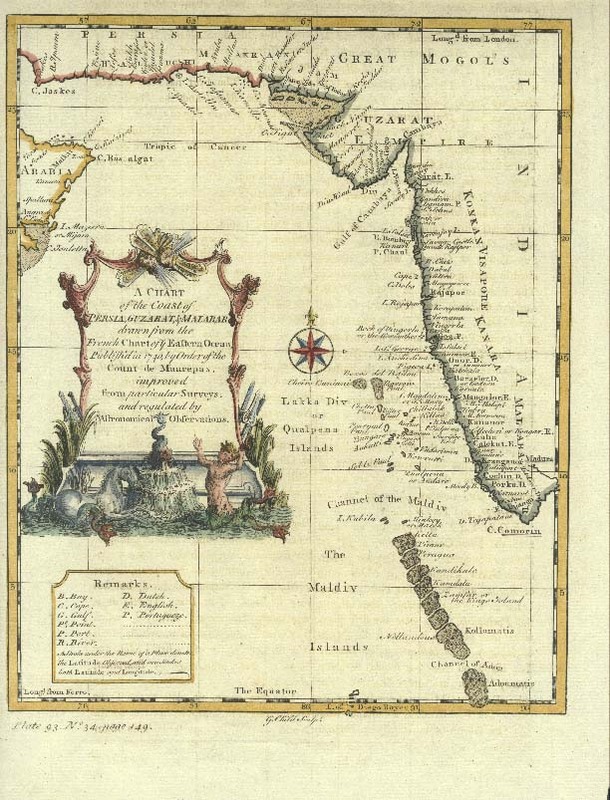 So, in those early days, Arab traders took the material from Calicut to Red sea ports, where the cloth went by the usual routes to Alexandria and then to the European and Mediterranean shores. Europe used wool, leather and silk for dressing, cotton was not well known. But once it became popular with the ladies, there was no stopping the demand. After the EIC got entrenched in India the EIC had started Calico import from Calicut by1631 and this import went on to create the large mills in Manchester. 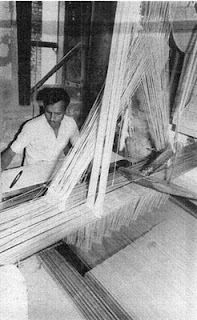 Later the cheap factory manufactured cloth came back to Indian shores and virtually killed the handloom industry. By the 20th century fine Calico or muslin weaving had petered out though textile weaving was still practiced in villages for domestic consumption. Resurrected somewhat by the Basel Mission, the handloom industry as such continues at a less than steady pace these days, though the practice of children not following the traditional weaving practice meant diversification of the weaving community into other avenues and further decline of the industry. The name Muslin comes from Masulipatanam and the material is same as Calico though sometimes considered a finer or sheerer variety. Muslin clothes were picked up by ancient Greeks from the East Indian port town Masulipatam, known as Maisolos and Masalia in ancient times and the name 'Muslin' originated from the name Maisolos. Muslin in US is Calico in Europe. So it finally comes down to the weavers. Who were the weavers? They were migrants belonging to the Chaliya or Saliya communities from Tamil Nadu, Andhra or Kanara regions. Who brought them into Malabar? Was it persecution, trade & economy or choice? The first legend is that the Zamorin of Calicut invited the weavers. The second legend states that the Kolathiri Chirakkal Rajas of Kannur brought weaver families from the traditional weaving communities of Saliya from other regions and settled them in colonies. 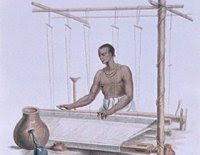 The third states that the weavers of Calicut migrated to the Kolathiri kingdom after being ousted from Calicut by the Mangat Achan. Why were they needed in Malabar? Did they stray in? While legend states that they strayed in during the 13th century after the left hand and right hand caste (read my blog on this subject to understand the details) agitations in Tamil Nadu (Then again it is stated that the Chaliyas of Malabar were either from Karnataka, Andhra or Tamil Nadu – real origins unknown), It could have been due to the desire of these rich families to wear fine cloth that they had seen immigrant Brahmins or visitors wearing at temple occasions and their subsequent monetary proposals. Nevertheless any settlement of foreign people in Malabar required the supported of the ruling class. So it is safe to assume that the Zamorin of Calicut (Much later the raja of Travancore followed suit and settled a number of families in Balaramapuram) and the Kolathiri’s invited them to stay and follow their trade. Interestingly the immigrant Saliyas adopted the customs of the chosen land and stayed for good. With that started the advent of weaving in Malabar. In dress and manners they resemble the artisan castes of Malabar, but, like the Pattar Brahmins, they live in streets, which fact probably points to their being comparatively recent settlers from the east coast. They do not wear the sacred thread, as the Sale weavers of the east coast do. This is the only Malabar caste which has anything to do with the right and left-hand faction disputes, and both divisions are represented in it, the left hand being considered the superior. Apparently, therefore, it settled in Malabar some time after the beginnings of this dispute on the east coast, that is, after the eleventh century A. D. Some of them follow the marumakkatayam and others the makkatayam law of inheritance, which looks as if the former were earlier settlers than the latter." It is said that they were originally of a high caste, and were imported by one of the Zamorins, who wished to introduce the worship of Ganapathi, to which they are much addicted. The latter's minister, the Mangatt acchan, who was entrusted with the entertainment of the new arrivals, and was nettled by their fastidiousness and constant complaints about his catering, managed to degrade them in a body by trick of secretly mixing fish with their food. They do not, like their counterparts on the east coast, wear the thread; but it is noticeable that their priests, who belong to their own caste, wear it over the right shoulder instead of over the left like the Brahman's punul, when performing certain pujas (worship). In some parts, the place of the regular punul is taken by a red scarf or sash worn in the same manner. They are remarkable for being the only caste in Malabar amongst whom any trace of the familiar east coast division into right-hand and left-hand factions is to be found. They are so divided; and those belonging to the right-hand faction deem themselves polluted by the touch of those belonging to the left-hand sect, which is numerically very weak. After being expelled from the kingdom of Zamorin, Saliyas took refuge with Kolathiri kings. One day some of the community members killed the king's favorite dog which had interfered with their work. The angry king ordered them to create a golden dog that would eat rice balls from his hand, or else he would destroy all their Teruvus. By invoking their community god, the Saliyas created a golden dog. When king tried to feed it, the dog bit his hand. As it goes, the king got further agitated and expelled the whole community from his palace. But the legend is silent on where they went, for they did not and stayed on in different parts of Malabar. If one were to look for an explanation, it could be related to the Edanga Saliyars. In the beginning both communities were present in Malabar. The Right-Hand castes and Left-Hand Castes were two opposing groups. In one such fight between Edangas and Balangas, Edanga Saliyas were beaten and driven out of Kannur. The beaten Edangas were forced to live in the areas of Kasaragod and Mangalore while the Balanga’s remained in Cannanore Chirakkal and Calicut. Other legends abound - Edanga Saliyas do not have surnames. Like many of the declared lower castes in India, they too have their myth of origin ascribing them to higher caste roots. According to this myth Saliyas were of Brahmin origin. At some point of time, they struggled to survive performing only Brahmanical rituals. Since manual labor was forbidden for Brahmins, the only way left was becoming shudras. They removed their sacred thread and tied it onto the spinning wheel thus symbolically ending their Brahmanism and commencing their life as weavers. Another states - As they were excommunicated from the Coromandel, they started mass suicide. Shiva prevented the last Chaliyan from committing suicide and gave the life-breath back to those who committed suicide. Then ‘Siva’ asked “Haven’t you seen spider weaving its web? Weave fabrics like that and thus started the origin of the fabrics that we are talking about. In Kerala, Salis or Chaliyans belonging to Balanga (Right Hand caste) division worship Vinayaka as their main deity whereas Chaliyans belonging to Edanga (Left hand caste) are primarily goddess worshippers. The spider story mentioned above lends credence to the etymology of the name - The common derivations in the literature is from Sanskrit word Jalika meaning spider or weaver or Prakrit/Tadbhava word Saliga meaning the same. With the advent of the Europeans, plain and colored cloth was exported in larger quantities and the knowledge of calico printing the Chaliyars possessed was quickly learnt and passed on to factories in Europe. It is reported that, in former days, the original Saliyans (of Tamil Nadu) were not allowed to sell their goods except in a fixed spot called ‘mamarathumedu’, where they set out their cloths on bamboos. During this 11th century migration, many of them also moved further to the kingdom in Ceylon and became known as Salgama’s.In Kannancherry we have the "Chaliya Therivu", located near the town's famous Vinayaka temple. The temple's patrons are the Chaliyas of Kannancherry.Methods of whitening of Calico and muslin with lemon water for example was picked up from the Chaliya techniques. By the early eighteenth century, worried by the popularity of Indian textiles, wool and silk makers in England began protesting against the import of Indian cotton textiles. In 1720, the British government enacted a legislation banning the use of printed cotton textiles ‘chintz’ in England. Interestingly, this Act was known as the Calico Act. Chintz incidentally was a name for Calico by the Dutch VOC. Mechanization came, and the Basel mission soon started a steam weaving mill 1883 with a capacity of 500-600 tones of cotton yarn. The Augsberg printers that we mentioned in an earlier blog Savages of Calicut became experts at calico printing. The Manchester mills perfected it. The famed Malabar pit loom was at its last legs by now. The industry that shot to fame from the pits in the small houses on the street had outlived its purpose. Large machines took over. So we see how trade related migration stemming from persecution moved the saliyas who were born close to cotton cultivation moved first from Andhra to Tamil lands, and then probably to Malabar. It could have been a direct transition from Andhra to Kanara and thence to Malabar, but the origins are a bit murky. The causes and reasons are clouded by legends and religion, but then such is the tale of most communities of India. Eventually, the weavers migrated again, not in location, but to other professions. The name ‘Calico’ however remains, probably trademarked by some multinational, proudly connecting for time immemorial, at least the textile to the Chaliya weavers of Malabar and the place that shot it to fame, Calicut. Thanks for the article, Maddy. "Ganapathi worship also came to Malabar with the Chaliyas" - Is this correct? Yes, Vinu - It appears so - Thurston also confirms it as in the passga equoted. Ganapati temples have been associated elsewhere with Vaniya communities. You must note here that we are talking about specific Ganapati temples, not Ganapathi worship as seen in a larger temple. Excellent post! We still need to find out how old is Calico, as it would tell us how old is Calicut. The 11th Century Jain scholar from Gujarat, Hemchandra, has mentioned Calico in his writing. Oxford English Dictionary dates the first use of the word to 1540. So we need to find out Arab , Chinese, Venetian or Genoese references to Calico between the two dates. Chaliyam was no doubt an important weaving centre and perhaps the name Chaliyars for weavers came from this place. But, linking Kora cloth with Korappuzha looks a bit far-fetched.Korah as the name of coarse cloth was common among all Dravidian languages. Korappuzha is called Akalaappuzha in Koilandy and its environs where weavers existed. The Kora in Korappuzha is more likely the fish Kora (Salmon) which is abundant in the mouth of the river, particularly during its migration from Arabian Sea to the river. Thanks CHF – this is an interesting discussion. Calico as a word originated as explained previously and is tied to the Portuguese/English presence in Calicut. The etymology of the word reveals a period around the 1530’s, when kalyko (Danish) was first mentioned. Cotton and cotton trade to the Romans, Greeks and Arabs and thence to other European shores goes back to ancient times. Previously, Kora cloth and finer muslin material went from Southern and Eastern ports to Western markets. 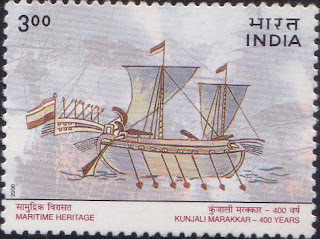 In those early periods the points of contact were mainly Muziris, Quilon, and various Coromandel ports. As far as Calico is concerned, there is also confusion since Calico in reality is the raw ‘Kora’ cloth and the American version of Calico is the printed raw cotton. An old British journal (Society of arts 1904) stated emphatically – The term Calico applied to cotton cloth dates only to the first importations into western Europe of the fine production mills of Southern India (Madura) from Calicut, after the Portuguese discovery of the Ocean highway to India round the Cape of Good Hope. Chaliya weaving trade as well as block printing predates their entry into Calicut. Incidentally, the earliest name for Cotton in trade records was based on the Sanskrit version of the flower with the seed ‘Karphas’ and (this later evolved to kapra - kapda) then it became Sindon (during the trade via Harappa in Sind). Then the Arabs took over and it became ‘Quton’ or ‘Kutun’, which is the basis of the word ‘cotton’ that we hear today. Dhanapala and Hemachandra mentioned printed cloth from India (Chimpa printed cotton with Chappanthi lotus print) in the 11th and 12th century, which was made by the block printing process they term today as ‘Calico printing’. As regards Korapuzha, many old place names were related to the trade that existed in the area, but as I said, the connection is purely a hypothesis, and of course one that may be far fetched. We are still not sure whether the cloth which was being exported as Calico was being woven in Calicut. There are various conjectures, some suggesting that the cloth cam from Tamil regions (where cotton grew in plenty) and that it was exported from Calicut which was the entrepot of the region. At the same time, there is the theory that Chaliyam (Beypore) gave Calico its name (apparently, in Greek, 'ch' is pronounced as 'k') Weavers are called Chaliyars because they originally hailed from Chaliyam area. According to a local historian, there was even a Jewish colony in Chaliyam which would commission cloth from local weavers and export these. Quite possible, after the unravelling of the story of Abraham Yiju. Thanks for an insight into how much Calico had impacted on western tastes. There are a lot of theru's in kannur and most of them worship Ganapathi. Each theru has its own Ganapathi mandapam and not kshethram. As said people from saliya community wear punul on right shoulder for any pujas during sankramam which starts on 1st of every malayalam month.